What Day Of The Week Was March 23? 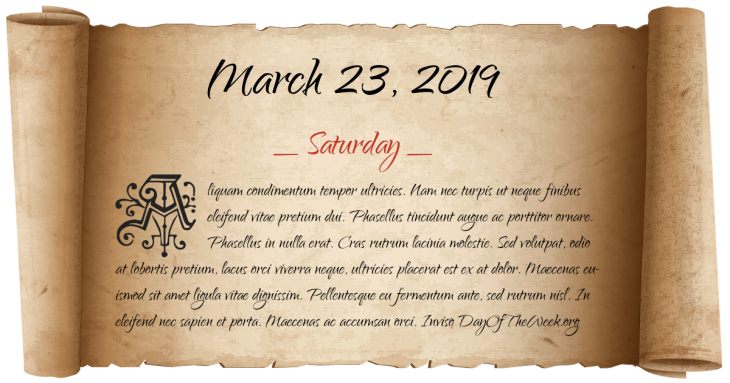 March 23, 2019 was the 82nd day of the year 2019 in the Gregorian calendar. There were 283 days remaining until the end of the year. The day of the week was Saturday. Tsar Paul I of Russia is struck with a sword, then strangled, and finally trampled to death in his bedroom at St. Michael’s Castle. After traveling through the Louisiana Purchase and reaching the Pacific Ocean, explorers Lewis and Clark and their “Corps of Discovery” begin their arduous journey home. The Ahmadiyya Muslim Community is established by Mirza Ghulam Ahmad in Qadian India. World War II: In the Indian Ocean, Japanese forces capture the Andaman Islands. Who were born on March 23?